Nigerian President Muhammadu Buhari has called the suspected kidnapping of dozens of schoolgirls by Boko Haram militants a "national disaster". Jihadists stormed the school in the town of Dapchi in the north east on Monday but it is unclear how many girls are missing. Parents have told the BBC that at least 100 students have not been found. The country's leader said surveillance aircraft and more troops were being sent to help with the search. Anger has been growing among parents about the government's handling of the incident, which has revived memories of the Chibok schoolgirl abduction four years ago. Dapchi, about 275km (170 miles) north-west of Chibok, came under attack on Monday, causing students and teachers to flee into the surrounding bush. Residents say that Nigeria's security forces, backed by military jets, later repelled the attack. Authorities initially denied the students had been kidnapped, saying they were hiding from their attackers. The Nigerian president apologised for the attack on Friday, in his first extended comments about the incident. "We are sorry that this could have happened. We pray that our gallant armed forces will locate and safely return your missing family members," he said in a statement. The Yobe state government had to apologise after mistakenly issuing a statement on Wednesday that said some of the girls had been saved by the army. The Nigerian activist group, Bring Back Our Girls, has been lobbying the government to release a list of names in order to clarify how many pupils are missing. 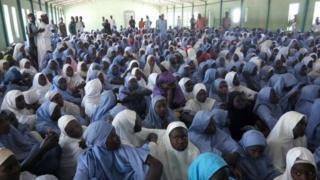 The group was established after the abduction almost four years ago of 276 girls from a school in Chibok. The location of more than 100 of those girls is still unknown. Residents of Dapchi told the AFP news agency that soldiers had been deployed in the town, but had left last month. Nigeria's defence spokesman denied that any troops had been withdrawn. Boko Haram militants have been fighting a long insurgency in the country's north in their quest for an Islamic state in the region. The conflict is estimated to have killed tens of thousands of people, and led to the abduction of thousands.